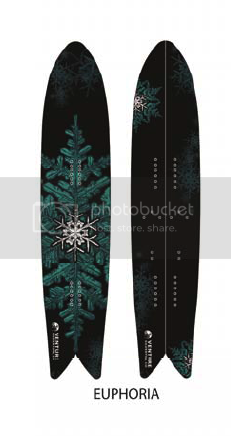 Just got a press release from Venture Snowboards mentioning next year’s Venture Euphoria. Yup, the Euphoria is back, and she’s looking just a wee bit different after Johan Olofsson had his way with her. In its latest incarnation, the Euphoria boasts rocker, reverse sidecut, and a swallowtail. A full insert pack allows it to be ridden with traditional bindings, though it is designed to excel when surfed bindingless. The Euphoria will be offered both solid and split, and in three different lengths: 156, 162, and 168cm. Will post up the pics of the rest of their lineup soon but thought the Euphoria was cool enough to get it’s own post. LOVE the new topsheets!